Crowdfunding IndieGoGo Max C Electric Skateboard – Maybe your next daily companion? MaxFind is running a crowdfunding campaign on Indiegogo for their news product- The Max C Electric Skateboard. What’s special about this electric skateboard and why we decided to cover it? Well, the reason is quite simple. We have seen campaign without the existence of a physical product ready to be shipped, and that is pathetic, but looks like MaxFind is willing to ship the product as soon as possible and the ETA is September 2017. How can the Max C Electric Skateboard help you? The Max C Electric Skateboard is something that can be your daily companion easily. It’s compact and fits in your backpack, it gets charged within an hour so that you can ride to your friends in the neighborhood and join a party. It weights at just 3.7kgs, so not so heavy but it can travel quite fast like a bicycle at around 24kms/hour (maximum speed). That’s not all; you won’t have to worry at all about the harsh rainy weather or dusty roads as the Max C is dust and waterproof with IP65 certification. 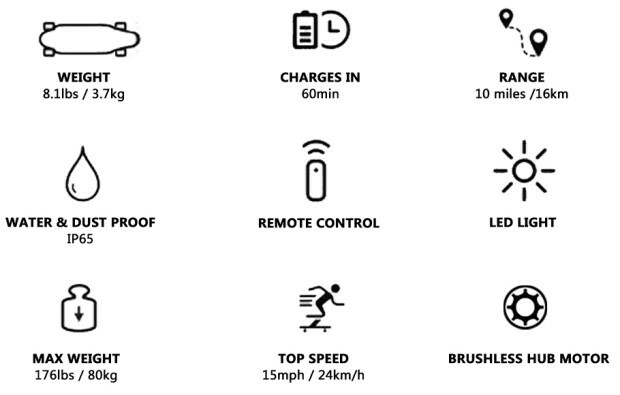 The Max C Electric Skateboard also comes with a tiny remote control and it also has LED lighting for improved visibility and safety. What do you pay for it? The max C Electric Skateboard costs just $259, which is an affordable price considering what it offers. MaxFind has stated that it can bear weight up to 80 kgs, so would I be able to ride it or not? As I have gained a lot of weight recently and I have always had an enormous overall figure of a gorilla, I am doubtful about my experience with it. However, the Max C Electric Skateboard looks promising, and it may arrive soon to us, now maybe we will have to either pick a guy not a gorilla and test it out, state tuned for more updates and in case we’re lucky enough to get it in India, maybe we may also review it. However, you can grab one for yourself right now as it’s available via the Indiegogo crowdfunding campaign. Previous articleXiaomi Mi 6 Vs OnePlus 5 – Battle of Flagships: Which is better?